The earliest-known ancestor of modern primates, Teilhardina‘s close relatives would eventually give rise to today’s monkeys, apes and humans. But one of the persistent mysteries about this distant cousin of ours is where it originated. Teilhardina (ty-hahr-DEE’-nuh) species quickly spread across the forests of Asia, Europe and North America, a range unparalleled by all other primates except humans. But where did its journey begin? New research shows that Teilhardinabrandti, a species found in Wyoming, is as old or older than its Asian and European relatives, upending the prevailing hypothesis that Teilhardina first appeared in China. Teilhardina‘s origins, however, remain a riddle. Teeth contain a treasure-trove of information and often preserve better than bone, thanks to their tough enamel. They can reveal clues about an animal’s evolutionary past, its size, diet and age as an individual and in geological time. While Teilhardina bones are very rare in the fossil record, its teeth are more plentiful – if you know how to find them. Bloch’s team of paleontologists, Morse included, have spent years combing the surface of Wyoming’s Bighorn Basin on hands and knees and then packing out 50-pound bags of soil to a river to screen wash. The remaining bits of bones and teeth – which can be smaller than a flea – are examined under a microscope back at the museum. 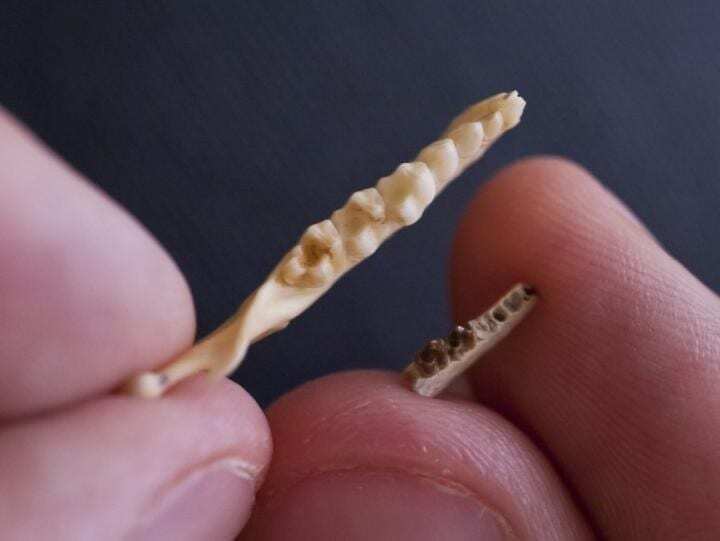 This painstaking search has built up the dental record of T. brandti from a single molar – used to first describe the species in 1993 – to hundreds of teeth, providing a broad look at the primate’s population-level variation. Studies based on a small number of teeth simply missed the diversity in Teilhardina‘s physical characteristics, Morse said. Teilhardina appeared during the geological equivalent of a flash in the pan, a brief 200,000-year period known as the Paleocene-Eocene Thermal Maximum, or PETM. This era was characterized by a massive injection of carbon into the Earth’s atmosphere, which sent global temperatures soaring. Sea levels surged by 220 feet, ecosystems were overhauled and the waters at the North Pole warmed to 74 degrees. “This dance of plants and animals with climate change happened over vast landscapes, with forests moving from the Gulf Coast to the Rocky Mountains in just a few thousand years,” Bloch said. While it was well-suited to Earth’s hothouse environment, Teilhardina disappeared with the PETM, replaced by new and physically distinct primates. It’s a sobering reminder of what can happen to species – including humans – during periods of swift climatic changes, Bloch said. Header Image – Teilhardina brandti likely resembled a modern tarsier, a small primate native to Southeast Asia. A lower jaw from a tarsier is pictured at top with a lower jaw from Teilhardina brandti for comparison. Credit : Florida Museum photo by Kristen Grace.